Our Story - Kauai Seascapes Nursery, Inc.
Kauai Seascapes Nursery, Inc. (KSN) is a family owned and operated business. KSN was started in the early 80’s by Steve Roush as a “backyard nursery”, lawn and garden service. 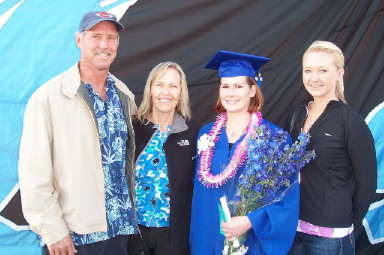 It transitioned into a lush tropical nursery and landscaping business when the Roush family (wife Mary, and daughters Serina and Michelle) moved to Kalihiwai Ridge in 1992. Steve established a half acre zoysia sod farm, a covered shade area for plant propagation and seedlings, an area for small to large potted plants and several acres of large field grown stock as well as some very large potted specimens. He became a collector and brought in unique seedling palms from the big island that are from all over the world. He collected seeds from his own farm and other places and sprouted them at his nursery. Steve had an obsession with Ti plants, and cross pollinated and developed many new hybrid Ti’s in unique and vibrant colors. He also collected and bred colorful crotons. 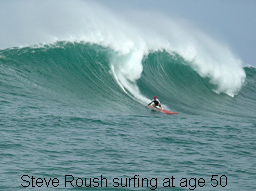 Steve was also an avid surfer, blue water hunter and fisherman and was well suited for life on Kauai. He always shared his catch with his many friends, neighbors and clients who became his friends. The remains of many fish carcasses are buried under some of our largest trees and palms, providing the richest source of natural fertilizer available. Since Steve’s death from melanoma cancer in April 2011, his wife Mary and daughter Serina have taken over the management of the business and nursery. Mary has assisted with the business’s client relations and invoicing for many years, and has a background in biology and the natural sciences and has always shared Steve’s deep appreciation for plant life. Serina moved back to Kauai from Portland, OR to help run the business, and has a college background in business, accounting and psychology, and also shares her parents love and interest in plants and landscape design. Daughter Michelle Roush also moved back to Kauai to help out with managing the 5 acre farm and homestead when Steve became ill.
With the tremendous help of Steve’s devoted long time nursery employees, the Roush family will continue to operate Kauai Seascapes Nursery as a family business, and uphold Steve’s vision. Kauai Seascapes Nursery, Inc. remains a place devoted to plant propagation and new hybrid varieties of cross bred seedlings and has a fine collection of botanical specimens. We strive to provide unique and quality plant specimens for our clients on Kauai. The nursery is open Monday through Friday from 8am to 4pm and Saturday 9am – 2pm. For after hours and weekend appointments please contact Serina at 828-0444. Wholesale prices and discounts are available for contractors. For more information, please email info@kauaiseascapesnursery.com.